1. Mirrors are easy to clean and keep streak-free with a white vinegar spray and microfibre cloth*. 2. Fabric Softener* mixed with warm water is ideal for wiping down doors. It gently removes grime without lifting the paintwork. 3. Use toothpaste* on wooden tables to remove pen marks. 4. Deodorise carpets by sprinkling baking soda* on and leaving for 20 mins then vacuum. 5. Get stains out of chopping board by rubbing with half a lemon and baking soda. 6. Keep plug holes clear and free from odour by pouring some soda crystals* down the plug, then white vinegar and a little Zoflora*, and washed away with boiling water. 7. Clean your washing machine by using a dishwasher tablet in the drum, and some Zoflora in the drawer. Put on a 100 degree wash and voila! Clean as a whistle. 8. Keep bins from smelling bad by spraying a piece of kitchen roll with Zoflora and keeping at the bottom of the bin, under the bin bag. 9. Make your own eco-friendly kitchen cleaner. Mix a solution of white vinegar, water and add a few drops of tea tree oil into a spray bottle. 10. Use sugar soap* with warm water on stubborn bathroom stains. 11. Use a wet rubber glove to remove dog hair from upholstery by rubbing it across the surface. 12. White vinegar is great to get taps and shower heads clean. Just apply, leave for a few minutes and rinse off. 13. Have pots and pans looking brand new by applying tomato sauce all over, leaving for 30 minutes, then rinsing. 14. Get your whites back to their best without bleach with a lemon juice solution (one lemon's worth of juice to 4 litres of water). Soak your white garments for at least an hour and rinse in the washing machine. 15. The easy way to clean rugs is to mix a capful of fabric softener and a capful of washing gel in with warm to hot water and use with a clean cloth to work out grime and stains. 16. Clean out smelly fridges with a baking powder paste (just add a little warm water to make the paste). Give them a wipe down and rinse. 18. 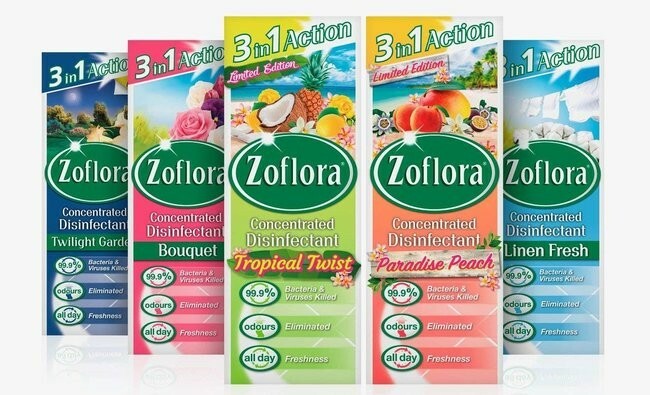 Refill empty diffusers with a diluted Zoflora solution. It works out much cheaper than buying replacements. 19. Soda Powder and Vinegar mixed together is also good for scrubbing toilet bowls and will work away those nasty stains with minimum effort. 20. Use warm water and Zoflora to clean radiators, and the smell will gently waft around. The inexpensive must-have cleaning product, not only smells amazingly clean but keeps bacteria at bay. It's also eco-friendly in the sense that it comes in little bottles, for you to add to a reusable spray bottle and water. Which means you're not going through lots of plastic bottles with diluted ready to use sprays. As it comes in a concentrated solution, it's heavily scented and comes in a variety of fragrances. Where's the best place to buy cleaning supplies? There are many other places, but you can really pick up the bargains in those mentioned above.